This photograph reminds me that despite all the talk I've been told about the good neighborhood life, the neighborly relations have points of strain as well. Attentive commentors have paid attention to what what I had failed to notice, that actually the expletives had been added by another person to what had originally been a fairly neutral note asking not to park in that place. 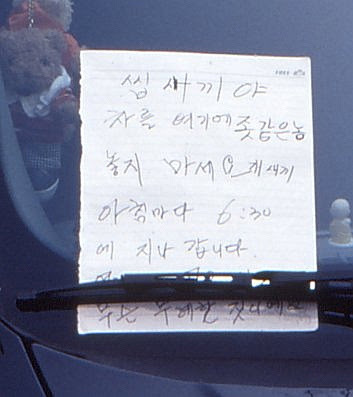 One line of the note is hidden below the windscreen wiper, but the last line seems to read musûn muryehan chisiyeyo ("what is this impolite act" or whatever). Or perhaps the same person who originally put up the note added the expletives later, when the note didn't produce a desired outcome? Interesting that the note writer chose to use 높임말. >_< Oh, my god... I'm Korean.. 한국에서는 주차문제가 이웃간 불화의 원인이 되곤 하죠. ^^; 그런데 욕과 존댓말을 같이 쓰다니..웃기는 이웃이네요. If you're going to swear like a sailor at least make sure you use those -입니다 suffixes. They really do class up the note. If you look carefully, I think the note is written by 2 different people or maybe by the same person on 2 different occasions. The first note was written in 존댓말 and "야 좃 같은놈... 요 개새끼" was added later, it looks to me. yes, I was wondering you've noticed that the note was creatively (!) reinterpreted by other passenger or a person who really has pissed because of similar situation. ;-) I think the original is exceptionally polite and one of the readers might thought it's not enough or inappropriate for a warning! Well done "anonymous"! This is hilarious! When I first read the note, I was wondering why this person was swearing on one side of his mouth, while using such a polite form on the other? Now it makes sense that someone came along and added their little literary flourishes!